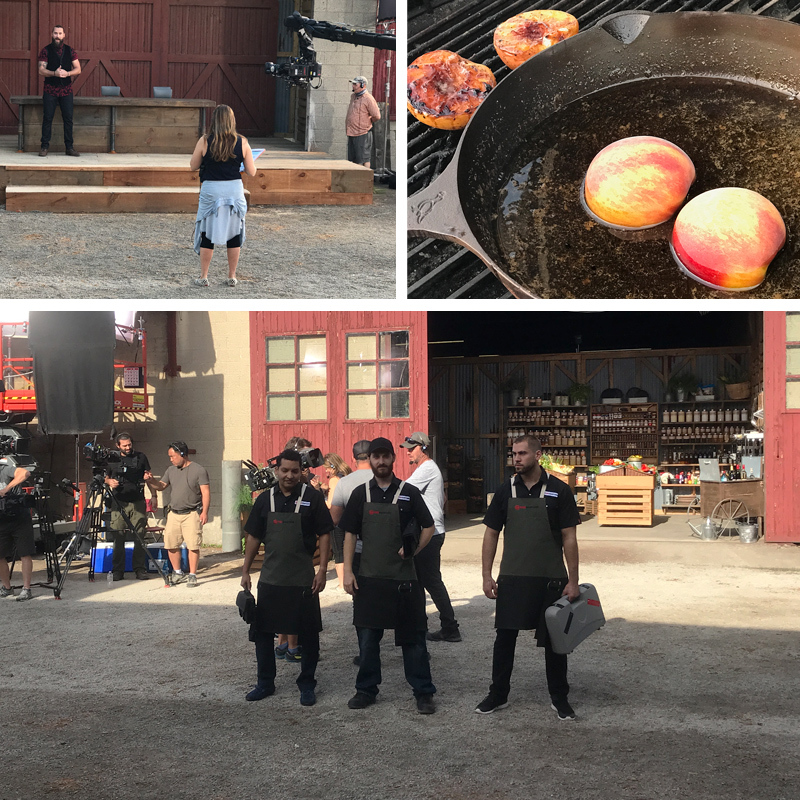 FireMasters is a new live-fire competition series on Food Network Canada. Fans of BBQ Pitmasters will love the format of this show. Each episode starts with three competitors cooking a dish that represents them. One is eliminated, and the winner of that challenge gains an advantage in the next challenge which is in the form of “either/or” Peanut butter or jelly … ham or cheese, for example. The winner of that challenge cooks against one of the judges — a totally new twist. This challenge is a bit longer — 45 minutes — and it involves cooking, again to a theme, a protein, two side dishes, and a dessert. That’s a lot of food to cook in 45 minutes, so fortunately, each person gets a sous chef to help. The show was filmed in Hamilton, outside Toronto. An old warehouse was transformed into such a cool set. Each competitor has a decked-out, top-of-the-line cooking space with Napoleon grills — two gas grills, a charcoal grill, and a bullet smoker. In addition, there’s the FireMasters fire pit, fashioned out of concrete blocks, with several adjustable cooking areas. Being on a show set is a lot like summer camp. New faces, old friends, and a highly skilled and professional crew dedicated to producing quality television. In the past, some of the same people seemed to show up on every series. The casting directors for FireMasters did such a good job of finding new talent to mix in with some familiar faces. The host of the show is Dylan Benoit, a Canadian chef now living in the Cayman Islands. His deep knowledge of food traditions from all over the world, combined with a fabulous personality and sharp chef skills made judging and the commentary so interesting and educational. Mark my words — he’s going to be a huge food television star. I judged with such a knowledgeable group of people — you can read more about them here. Mike Sheerin and Architect Films were top-notch. The producer, Jen Pratt Visser, was an integral part of Top Chef Canada, and she ran an incredibly tight ship. The care and thought which which she commanded the set, communicated with the talent, and solved every challenge along the way left me filled with a huge amount of respect and admiration for her leadership and skill. Barn doors opened to reveal a stocked and stacked pantry that was a thing of beauty. Every ingredient you could possibly want, all neatly organized and labeled — the freshest fruits and vegetables, quality proteins, including all kinds of Certified Angus Beef cuts, and dairy, and all manner of condiments — was available. Contestants could even harvest herbs from a garden. One wall contained all types of small appliances, and a large array of platters and smallwares for plating. 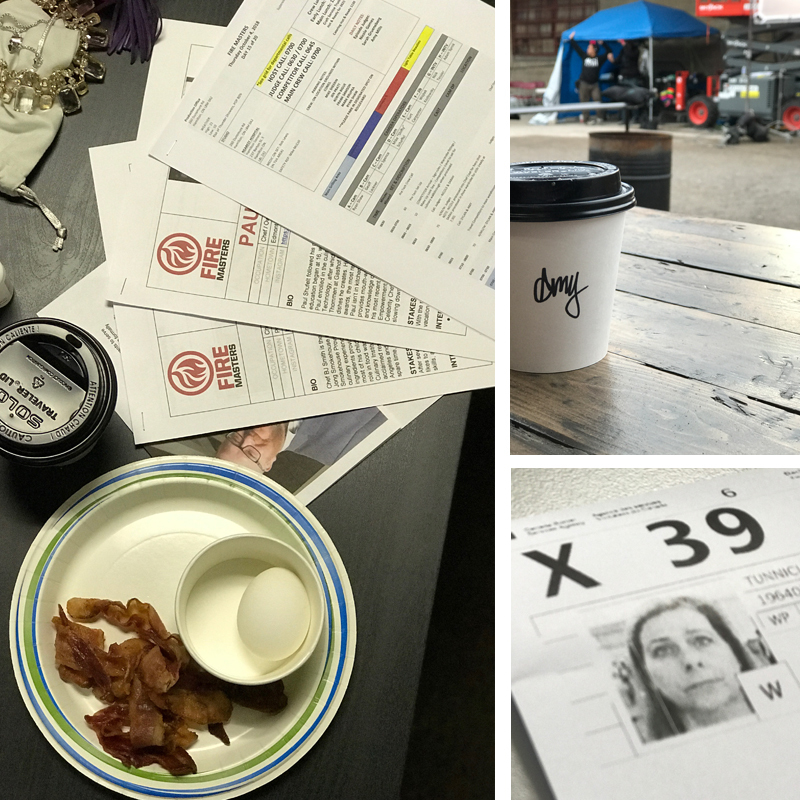 Being part of a show requires quite a bit of work before even arriving on set. Because this show is filmed in Canada, I had to go through an immigration/work permit process. I traveled to the set several times and some entries were easy; others got a little complicated. It all depends on the immigration agent at the desk. There are creative briefs to read and digest, both at home and each morning prior to call time. Getting a wardrobe together and approved, via many texted photos, is also a process. You don’t really think about it while you’re watching a show, but the judge’s panel and host all need to coordinate and look good against the background, and not detract or distract from faces and conversation. Patterns and stripes/small checks generally don’t look on camera. As a female, I always appreciate hair and make-up help and Lucky Bromhead and Ana Sorys were the best. 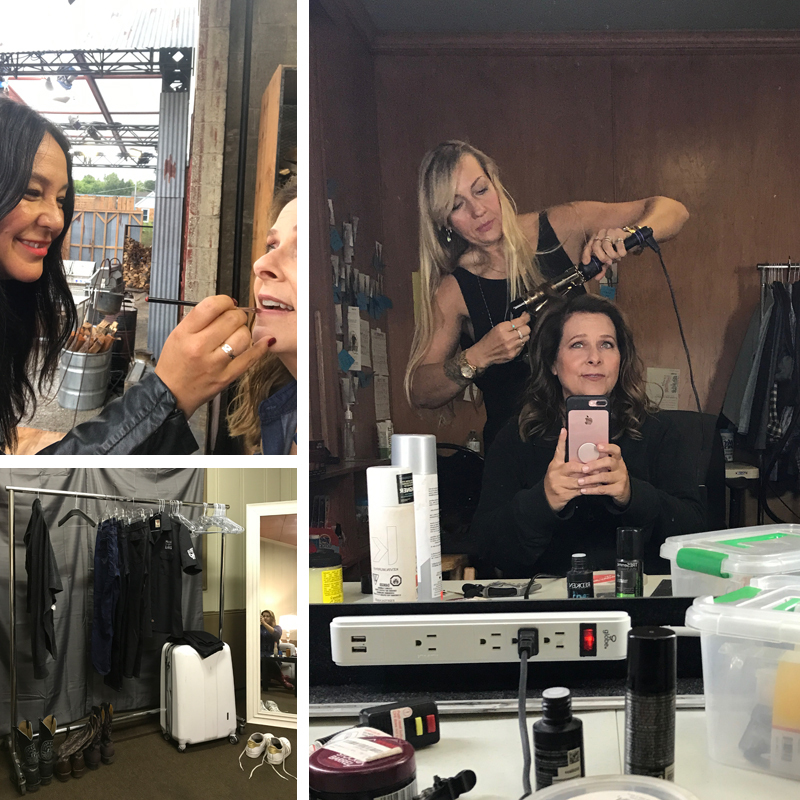 I have the unique perspective of being on set on day one and on last day as well. The weather ranged from very hot to pretty cold, with a torrential downpour and flooded set thrown in for good measure. By the time you read this post, my first appearance will have already aired, and, SPOILER ALERT, I cooked against Rusty Johnson of Rusty’s BBQ. I haven’t been able to watch the episode, but obviously, I lived it, and I can say without a doubt it’s the fastest 45 minutes I’ve ever worked in my life. This was my first experience actually cooking on a show and I was very apprehensive. The adrenaline rush is like no other. A protein, two sides, and a dessert in 45 minutes is a real challenge — even with the help of an extremely experienced sous chef. During the entire episode, we watched from the judge’s table as the contestants failed to get the fire pit hot enough and the food low enough. My first order of business was to stoke up that fire, and, in doing so, it was my downfall. I removed the steak too late, and, as well all know, meat continues to cook while it rests. I was pleased with the flavor, but I knew it would be too done by the time it reached the judges. On the positive side, I was very proud of the bourbon-and-butter soaked grilled peaches, served on a swath of sweet mascarpone cheese. The judges really liked those, too, proclaiming them the “best bite of the evening.” I’ve never lost a competition that felt so much like winning. Watching Rusty cook all day, and then competing against him was such a thrill. Knowing that I helped him win $10,000 felt great. I have high hopes for the success of FireMasters. If you’re a Canadian friend, I hope you’ll tune in and cheer it on. I’m hoping Food Network US will pick it up soon. Being part of the production was a huge honor. Fingers crossed for future seasons. 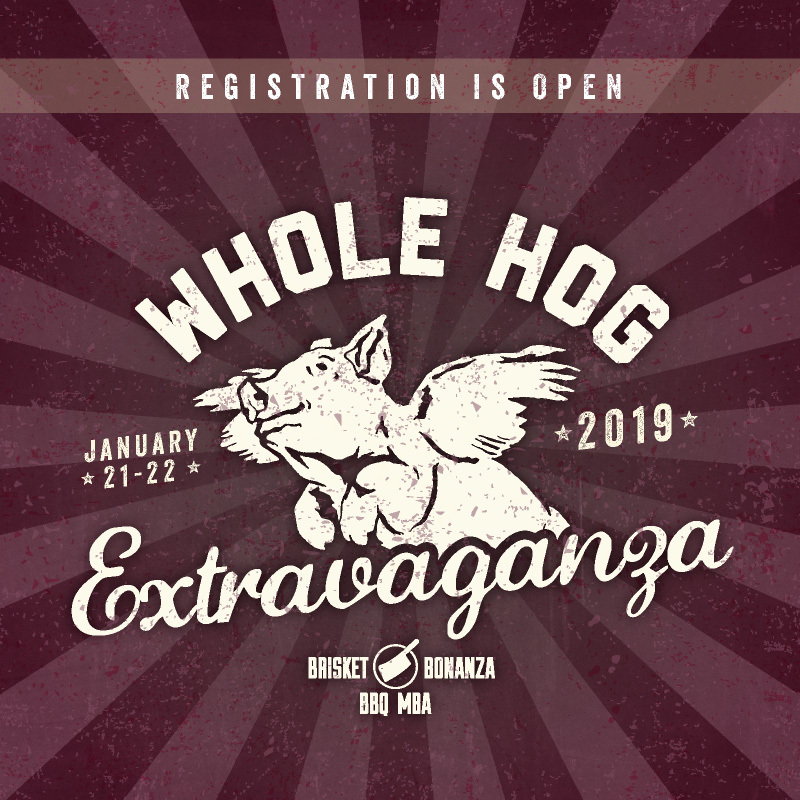 Our 8th annual Whole Hog Extravaganza/Brisket Bonanza/BBQ MBA is just around the corner and we have fewer than 20 spots left. 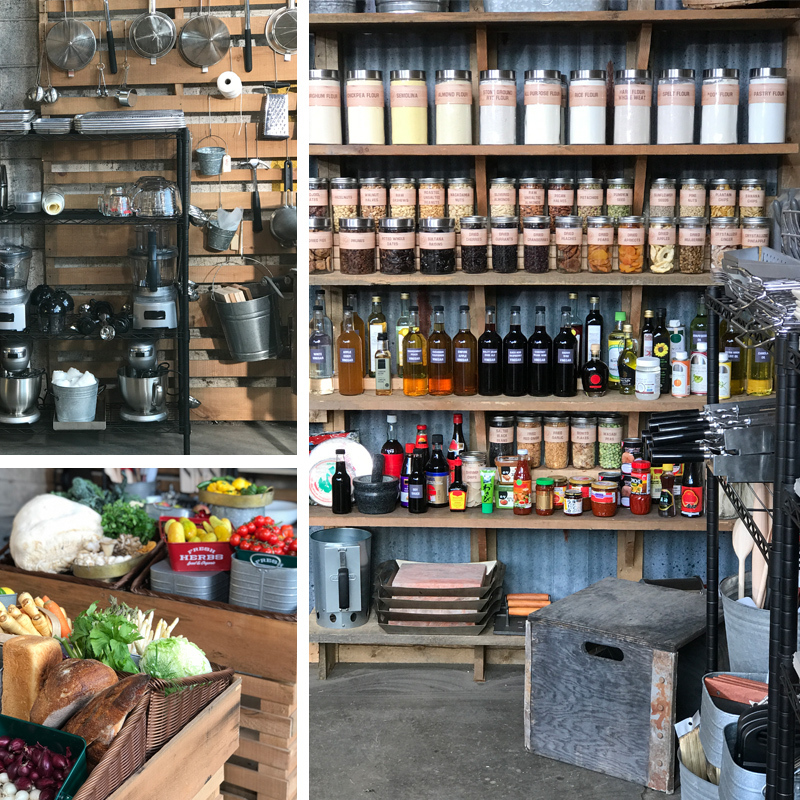 Click here for a peek behind the scenes in this article from The Local Palate. Our events are designed for restaurant and catering professionals and entrepreneurs or barbecue super enthusiasts. Here’s a link to a recent chat with Kevin Kelly of Kevin’s BBQ Joints where I answer many frequently asked questions. You can also listen to it as a podcast. The ability to watch every step of the prep and cooking process, and then taste the results makes this a one-of-a-kind experience. You’d have to travel over 15,000 miles to visit these restaurants. While the meats are cooking, we’ll discuss a variety of business topics. Just a few of this year’s special guests include Beth Schiff, casting director for CHOPPED, who will talk about the casting process for food television shows. Ken Goodman, prolific food and cookbook photographer, will give his best practices for creative beautiful iPhone photography for social media. Kat Kinsman, journalist and author of Hi, Anxiety, discusses the epidemic of depression and anxiety in restaurant kitchens across America — a timely and vital topic for all of us in the business. 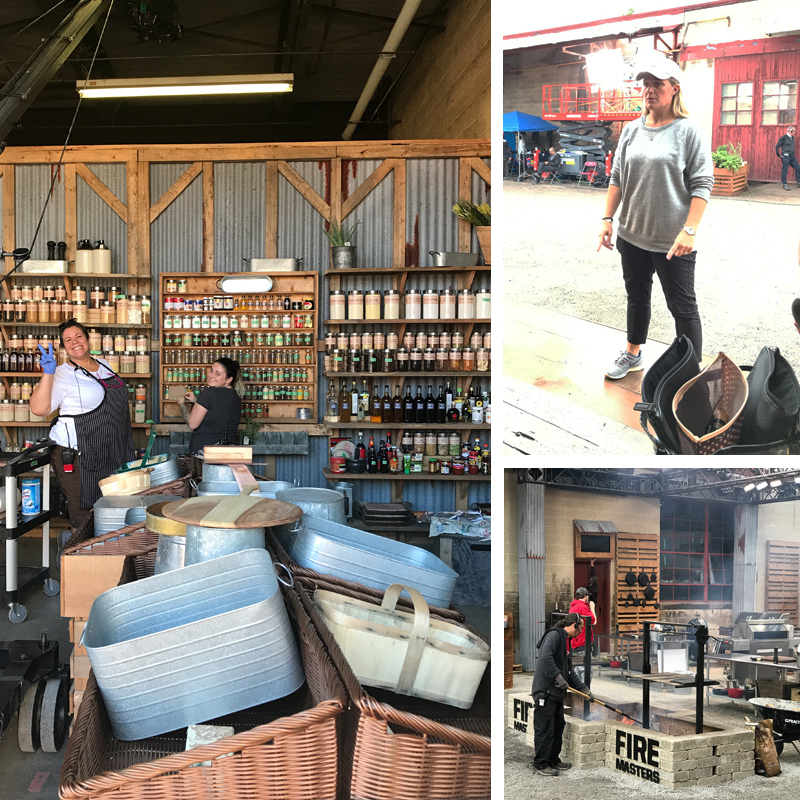 You’ll leave with dozens ideas for improving your business, from running a profitable bar, catering with whole hogs, best methods for serving brisket in a restaurant and catering operation, and adding your own signature style and flavor profile to your barbecue. 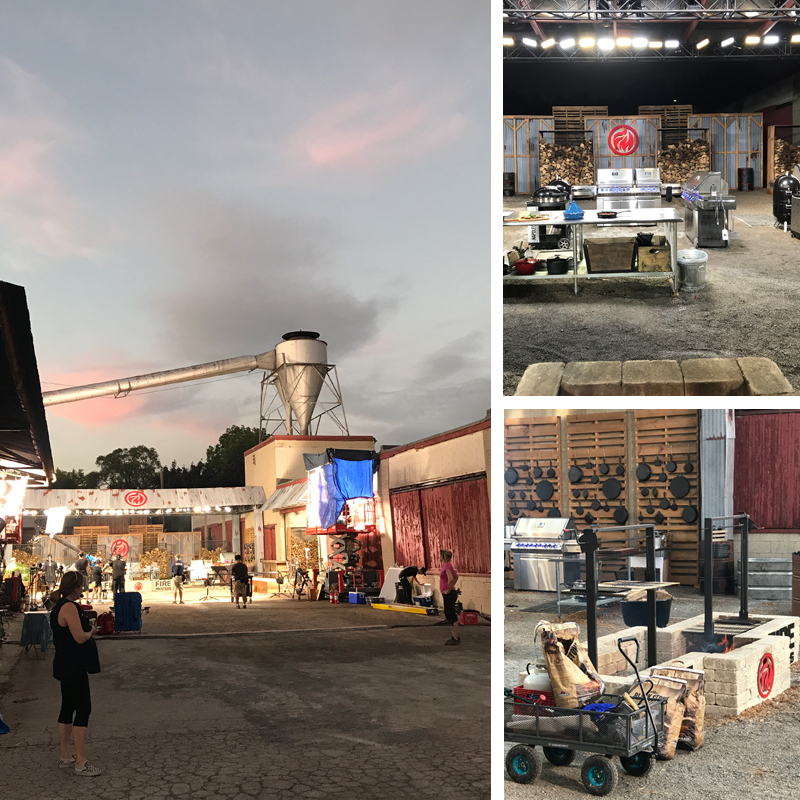 We’ll be cooking on a variety of pits, including a concrete brick pit, Ole Hickory Pits, Austin Smokeworks, and a Camelback, and the pitmasters will use their signature spices and woods to create flavor profiles that are uniquely their own. Barbecue’s most talented cooks and best business minds will share their skills and knowledge in this intimate setting. Class size is purposely small so you’ll be able to get to know one another and rub shoulders with all of the guest pitmasters and speakers. Community is what makes the barbecue world go around and creating opportunities to foster relationships is important to us. The food at our events is unparalleled, especially during this program. You’ll taste heritage and commodity whole hogs cooked with different methods and using different seasonings and wood, several cuts of Certified Angus Beef, and more. RH Weaver will lead us through a whiskey tasting and Aaron Kleidon from Scratch will be pouring his famous foraged brews. You’ll get to see behind the scenes of our catering operation and get great ideas for decorating and setting up events. Hope you’ll join us. Space is limited, so reach out today via the link below. Click here to download the schedule and accommodation information.